The first thing to learn about Yoga Nidra is that there is no wrong way to do Yoga Nidra. While certain kinds of yoga may not be for everyone, anyone can do Yoga Nidra. Simply put, if you can breathe, you can do Yoga Nidra! (If you have trouble laying down, accommodations can be made). Roughly translated as “Yogic Sleep”) Yoga Nidra occupies a space somewhere between a shavasana (the final resting pose in most yoga classes) and a guided meditation. In fact, it is often described as meditation for those who struggle with meditation. 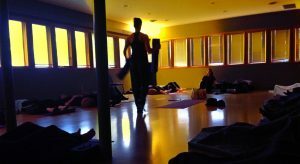 Instructor Amy Prais, RYT, recently completed a course in teaching iRest Yoga Nidra, and she is excited to bring it to Creative Therapeutics for its debut. iRest Yoga Nidra has been developed over the past twenty-six years by Richard Miller, PhD, a clinical psychologist, author, researcher and yogic scholar, and is uniquely suitable for a Western audience. Extensive research has shown that iRest effectively supports the healing process across a broad range of populations. Currently, there are iRest programs in military hospitals across the U.S., as well as in correctional facilities, hospices, clinics, schools, and organizations supporting personal growth and well-being. iRest is integrative in that it heals the various unresolved issues, traumas, and wounds that are present in the body and mind. It is restorative in that it aids its practitioners in recognizing their underlying peace of mind that is always present amidst all changing circumstances of life. What to expect: Class will begin with some gentle movement to help calm the body as you rest. Participants will lie comfortably on the floor (or whatever position of maximum comfort works for you). You will then be guided through an awareness of your body in the moment–much as you might in another form of guided meditation. iRest Yoga Nidra has been used to help people with insomnia, PTS, and many other issues. It can also help people feel more alert. Certainly, it is a wonderful tool for letting go of stress and living in the moment. It represents a simple yet profound way to care for ourselves, a way to create a foundation on which to thrive. This entry was posted in Yoga, Meditation and tagged meditation, yoga, stress management, yoga nidra, insomnia, anxiety, PTSD. Bookmark the permalink.